Many congratulations to Ava Brooks, Isabella Stratton-Thomsett and Carys Westgarth, three of our young Academy swimmers, who swam in the Swimathon 5K, raising over £800, what an amazing achievement, well done girls! Colchester Swimming Club's swimmers were joined by some of the club's Academy swimmers last weekend at the first round of its Club Championships events. 13 of the Academy's swimmers attended and competed in a range of strokes alongside their club team mates. All competitors held their nerve and put in some terrific performances. Those competing were: Katelyn Parfitt, Olivia Ledwidge, Daisy Himsworth, Amy Milburn, Verhonaa Narayanasamy, Olivia Vinter, Emily Reedie, Theo Gardiner, Alec D'Arcy-Jones, Joshua Bleck, Jack McCarthy, Isaac Farrugia and Harry Moonie. Colchester Swimming Club's swimmers were joined by some of the club's Academy swimmers at last Friday's time trials in preparation for this weekend's annual Open Meet. This Sunday, June 21st, will see some of the club's aspiring swimmers getting their first taste of competitive swimming at the club's 2nd Midsummer Madness Open Meet. We would just like to congratulate all of the swimmers who participated in this years distance swim. It proved to be an incredibly popular evening with swimmers far surpassing our expectations. There were 33 swimmers who conquered a mile and 4 of our younger swimmers achieved their first legal 50m, with many other swimmers exceeding targets in between. Such an event takes much organisation and without the support of our fantastic coaches and volunteers, we could not host such an evening. The start of 2015 saw another 7 Academy swimmers achieve selection into the Colchester Swimming Club competitive Junior swimming squad. The successful swimmers, Mia Perylzo, Owen William, Francesca Williams, Ben Sherratt, Cora MacKenzie-Gray, Jack Sheekey, Eloise Parry and Eloise Smart will now carry on their hard work and dedication to the sport as part of the junior squad. Swim Academy Manager Donna Cowan said of the moves, "This is an incredible achievement for them all. Their hard work and determination has paid off. They should be very proud of themselves." Launched in April 2013 to try build on the legacy of the 2012 London Olympic Games, Colchester’s new Swim Academy has already proved to be a huge success. 11 young swimmers have already been successful in achieving selection into the Colchester Swimming Club competitive Junior swimming squad, after just 30 weeks of teaching and coaching. The successful swimmers, some of whom are pictured with Colchester SC Head Coach Michelle Young, were: Gabriel Annis, Anola Jordan, Ross Jordan, William Pestell, Charlotte Tree, Sam Lemnell, Finlay Keating, Edward Cox, Holly MacCarthy, Lizzie Woods and Seb Tilley. 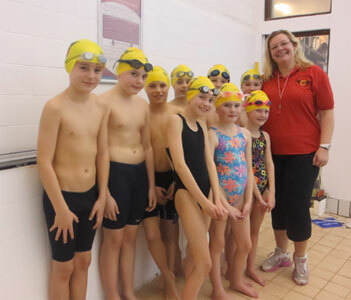 Swim Academy Manager Donna Cowan is proud of her protégés’ success, “The children have worked so hard each week to perfect their technique and some of them even enjoyed their first taste of competitive swimming in our Club Championships in November”. 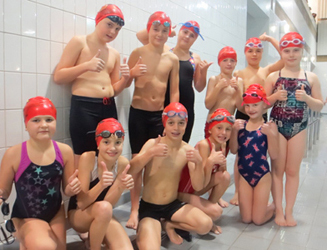 For the first time in the Club’s history, swimmers from Colchester SC’s new Academy donned their striking red swimming caps and made their competitive debut at this year’s Club Championships at the Leisureworld pool. In an effort to build on the Olympic legacy the Academy was launched in April this year, with the support of sponsor Dean Jackaman of local company Jackson and Co, to attract more youngsters to competitive swimming and is proving very popular, as children who have already learned the basic stroke techniques are taught improved technique, competitive starts, turns and finishes. The initiative is beginning to bear fruit, as 15 young Academy swimmers experienced their first competitive 50m races and the 100m Individual Medley. Cheered on by all the other swimmers and their proud parents they remembered their training and put in some great performances, finishing ahead of some of the yellow hats of swimmers in the main squads! Those making their debut were: Grace Gardiner, Stephanie Joseph, Molly Grieve, Holly McCarthy, Eliza Robinson, Scarlett Wicks, Franchesca Williamson, Lizzie Woods, Edward Cox, Sam Jackaman, Finlay Keating, Mark Milburn, Kieran Milkins, Felix Szpakowski and Sebastian Tilley.